Apple CarPlay and Android Auto are set to infiltrate dashboards around the world this year and next. Nearly every automaker has committed to offering one, the other, or both. But Toyota remains one of only two hold outs. 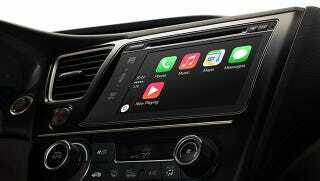 John Hanson, the national manager of Toyota's advanced technology communications, said while the company talked frequently with both Google and Apple, it currently had no plans to adopt Android Auto or CarPlay in the United States. "We may all eventually wind up there, but right now we prefer to use our in-house proprietary platforms for those kinds of functions," Mr. Hanson said. Entune, Toyota's system, seems to be doing okay in the market, avoiding the pitfalls of Sync/MyFord Touch and Cadillac's CUE by going with a simpler, no-frills approach. But that's not going to last, particularly when every one of Toyota's competitors are supporting at least one of the platforms. However, Hanson telling the Times that Toyota won't be offering either system in the U.S. is an indication that it could land in Europe or Asia first. That almost gels with a botched announcement last year where Toyota's UK arm said it was planning to bring CarPlay to market, only to retract it a day later. The only other automaker that hasn't committed to offering either is Porsche, despite its siblings at Audi and VW pledging to bring both to market.